Vegetarian Stuffed Peppers are meal-prep friendly and loaded with quinoa, bulgur, black beans and marinara sauce. Pair one with a side salad for an easy weeknight dinner, or make ahead for busy weekday lunches! Pre-heat oven to 350F and grease a 10″ cast iron pan, or similar sized casserole dish. In a large bowl, mix together the quinoa and bulgur blend, black beans and 2 cups of marinara sauce. Set aside. Slice the tops off the bell peppers and scoop out the seeds and membranes. Discard the tops or reserve for another use. Rinse the peppers in water and use a towel to pat dry. Using a spoon, scoop the quinoa/bulgur/black bean mixture into the cavities of each of the peppers and arrange them in the pan or casserole dish so they are packed together and holding each other up. 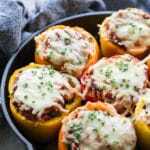 Divide the remaining 1/2 cup of marinara sauce on top of each stuffed pepper and top with grated cheese. Bake for 35-40 minutes, or until the peppers have softened and the cheese has melted. Be careful not to over bake as the peppers will get mushy. Serve immediately or store in an airtight container in the fridge and enjoy within 3-4 days. I used a homemade Tomato Basil Marinara Sauce in this recipe, but it takes about an hour to make from start to finish. So if you’re short on time, you can use store-bought marinara or pasta sauce. You can also use store-bought tomato sauce, but if it is unseasoned, you will want to add some garlic, oregano and basil for added flavor.